Pakistan has arrested senior Libyan al-Qaeda suspect Abu Faraj al-Libbi, the government says. Libbi is said to have been third in al-Qaeda and is wanted over attempts on the life of Pakistan's president. US President George W Bush described the reported capture as "a critical victory in the war on terror". 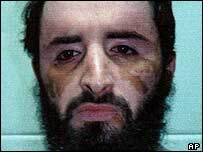 The BBC security correspondent says it is the most significant arrest since Khalid Sheikh Mohammed, the alleged mastermind of 9/11, in 2003. Libbi was captured in the past few days after a clash in north-western Pakistan, officials said. Pakistan has stepped up military operations against al-Qaeda suspects in the region, near where Osama Bin Laden is widely believed to have been hiding. Pakistani Information Minister Sheikh Rashid Ahmed said security agents had already gathered "a lot of tips" from the arrest, which meant they were "on the right track" to eventually capturing the al-Qaeda leader. "This is a very important day for us," Mr Ahmed said. Libbi is wanted in connection with two attempts on the life of Pakistan's President Pervez Musharraf in December 2003, in which 17 people died. He was regarded as the prime suspect in a number of bombings in Pakistan, including an attempt last year to kill Prime Minister Shaukat Aziz. 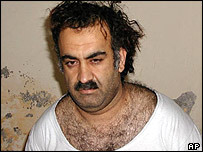 Libbi was also alleged to have taken over Khalid Sheikh Mohammed's role in al-Qaeda after the latter's capture. In Washington, the US president said Libbi was a "top general for Bin Laden". He was a "major facilitator and chief planner for the al-Qaeda network", Mr Bush added. "His arrest removes a dangerous enemy who was a direct threat to America and for those who love freedom." Libbi was held with at least five other foreign al-Qaeda suspects in a clash in Waziristan in North-West Frontier Province, security sources said. A senior security official told the AFP news agency: "It is a very big success because he was the hand who was moving all the terrorist puppets in the country." Libbi appeared on a Pakistan most-wanted list last year. Pakistan had put a reward of 20m rupees ($340,000) on the head of Libbi in August last year. Pakistan has been a key ally in what the US calls its war on terrorism. Islamabad has handed over more than 700 suspected al-Qaeda operatives to the US. But Pakistan's Interior Minister Aftab Khan Sherpao said it was too early to say if Libbi would be taken in to US custody.